← What Are Those Numbers? In the early part of the 20th century, the daughter of cartoonist and author Johnny Gruelle (1880–1938), brought him a faceless rag doll she found in the attic. 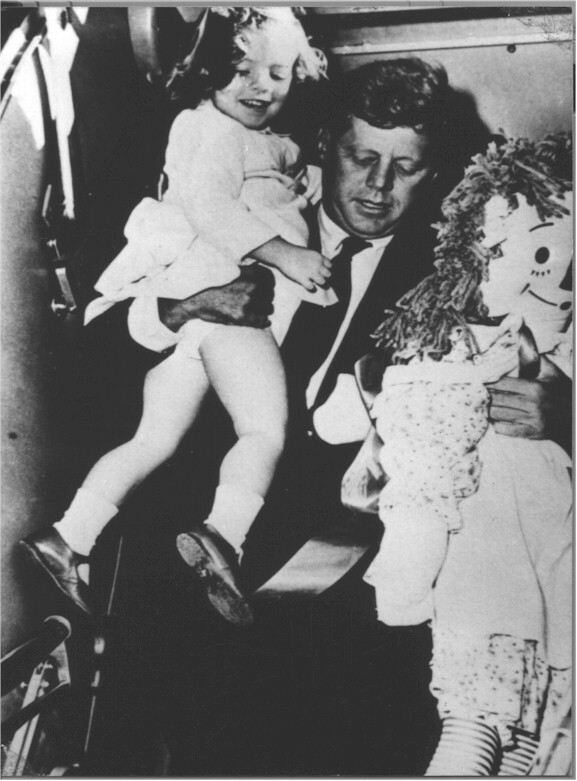 The doll is thought to have belonged to her grandmother (source). After he drew a face on it, Gruelle christened the doll Raggedy Ann. 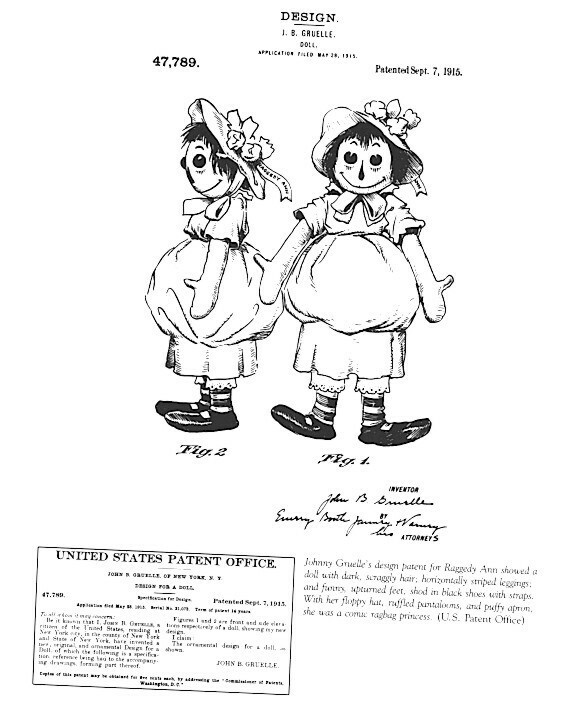 In 1915, Gruelle patented the doll (see pic at left) and, 2 years later, published the first of many Raggedy Ann (and later, Raggedy Andy) stories. Sam, in making each of them, utilizes various stitching techniques, painting styles and fabric. The closeu p on the right of the Raven Queen’s face hints at Sam’s artistry. Delightfully, some of the dolls come with various accessories, including doll-sized knitting, embroidery bags, maps and books! 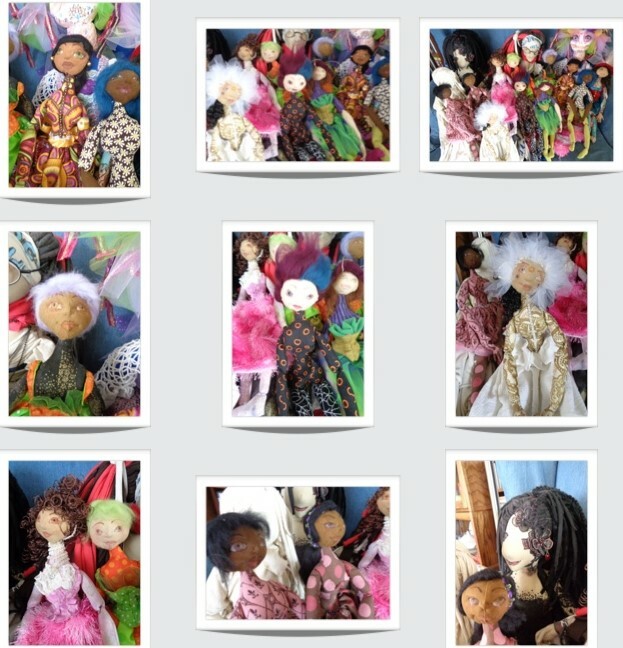 These soft sculptured dolls are the opposite of the mindless, mass produced rag dolls that usually grace a child’s bookshelf. (Sorry, Raggedy Ann/Andy.) 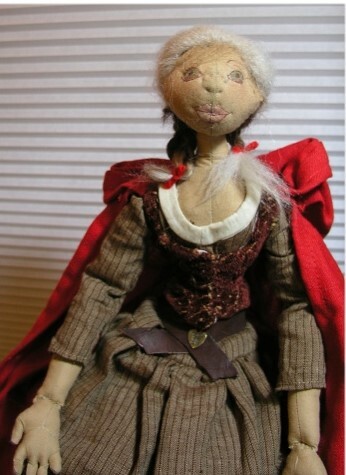 Rather, each of Sam’s soft sculptured dolls is a work of art, thoughtfully made and with great attention to detail. If you happen to be in the Willamette Valley on Friday, September 11, take advantage of Springfrield’s “2nd Friday Artwalk” in its historic downtown and see some of these soft sculptured ladies on display at L’Etoffe Fabrics. I’m sure the originally Raggedy Ann doll was unique – certainly hand made (and probably lovingly) for a child before the turn of the 20th century, even before receiving her hand-drawn face. Just as rag dolls have comforted children through the millenia, after Marcella died very young, her grieving father kept Raggedy Ann close by. 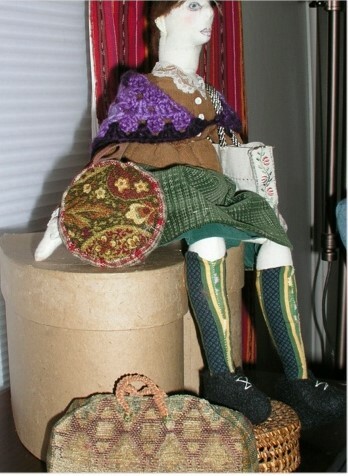 This entry was posted in Miscellany, Other Fiber Arts. Bookmark the permalink. Maybe your mom will share them with her children … if you promise to keep them in display cases! Thank you … Sam’s creations are pretty show-stopping. I think a lot of people had them .. probably gifted by doting aunts and uncles! How bizarre, NO accounting for taste……….I LOVE Raggedy Ann and Andy and those soft sculptured dolls give me the creeps!! Those soft sculptured dolls are amazing. 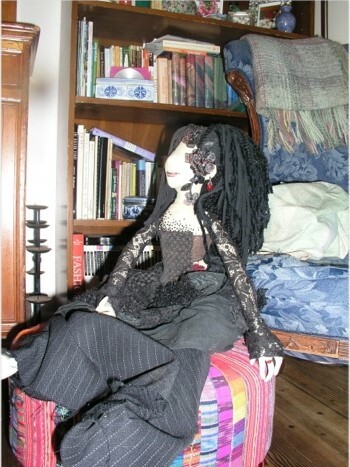 My mother had (still has somewhere) the most amazing collection of hand made dolls that were bought for her by relatives when she was young. They are exquisite with hand painted faces and costumes with intricate detailing that you would not find today. We were occasionally allowed to take them down from their display case and play with them. Those soft sculptured dolls remind me a bit of them. I know so many people found Raggedy Ann & Andy to be creepy, but I loved them. I’ve heard there was a Twilight Zone episode where Ann had a butcher knife so I know that was part of it for some of them. Anyway, I really enjoyed this post! I had a Raggedy Ann and Andy doll, perhaps we all did? Interesting post. You’re right about Raggedy Ann being kind of creepy — I had an animated movie about them when growing up and it was really trippy and pretty scary. Those new dolls, however, are much nicer! 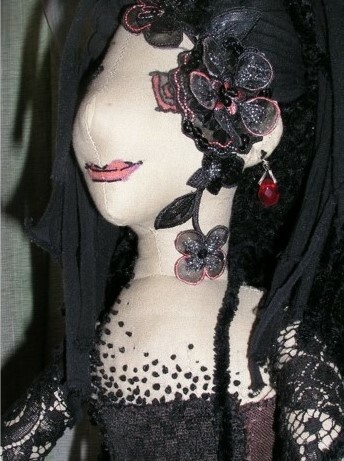 I have always loved dolls and have made a number in fabric as well as polymer clay. 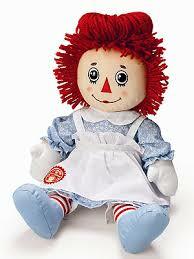 I don’t believe I had a Raggedy Ann but when I had my first child, I gave him a Raggedy Andy. He showed me what he thought of it (he never played with it but I put it in his crib for company) when he was napping one day (supposed to be napping) and had a BM, he dug some of it out of his diaper and smeared it all over Andy’s face. That ended any future history. My second child was a boy who loved stuffed animals and I’m sure would have loved a ‘Andy’ but I wasn’t inclined to get one for him. How interesting… and I agree with you. Ann and Andy are sort of creepy. My grandmother and grandfather used to make them! I do have a pair that Grandmother entered in the county fair, along with her red ribbon.